I was fourteen when I first heard Sarah Makem's unforgettable voice on the Tradition label's Lark in the Morning album - a recording that provided a marvellous introduction to traditional Irish music (especially singing) to those of us living in the isolation of the American midwest. I was already acquainted with the more commercialised recordings of the Clancy Brothers and Sarah's famous son Tommy, but this felt more like listening to the field recordings of Ozark singers that I was getting out of my local library at the time. Shortly afterwards, I acquired two Clancy Brother and Family albums, on one of which I first heard Sarah singing As I Roved Out. I was ignorant of the BBC radio program and Sarah's contribution to it until much later, when I also discovered the Folktracks release (which also featured Sarah's cousin, Annie Jane Kelly), as well as the 1968 Topic LP, Mrs Sarah Makem, Ulster Ballad Singer. Given the obvious breadth of Sarah's repertoire as represented on these recordings, it should have come as no surprise that there were more unreleased recordings of her yet in store - but I could never have imagined how many more. Those of us in the worlds of traditional singing and of song scholarship therefore owe a huge debt of gratitude to Musical Traditions for assembling this massive collection - seventy songs in all: fifty-four of Sarah (plus twelve alternate recordings of several of the songs), as well as five tracks of Annie Jane Kelly. The project originated when Paul Carter - who, with Seán O'Boyle, had made the recordings for the '68 Topic LP - approached Rod Stradling with five extra tracks from those recording sessions. Since Topic had recently bought Peter Kennedy's recordings of Sarah and Annie Jane (along with the rest of the Folktracks catalogue), arrangements were then made to produce a new album for Topic called The Heart Is True, consisting of seventeen tracks from these two sources. The Musical Traditions set therefore contains what was 'left over' after the tracks for the new Topic release had been selected! Sixteen of these tracks are alternative recordings, however, and only one song, The Banks of Red Roses (of which there seems to have been only one recording made), does not appear on the MT set. Apart from this exception, what we have in this 3-CD set is not so much an album as it is an archive of a single traditional singer's repertoire, all recorded 'in the field' and assembled from a dizzying variety of sources, including the collections of Peter Kennedy, Diane Hamilton, Paul Carter, Michael O'Donnell, and various members of the Makem family. The comprehensiveness of this project is something that has marked Musical Traditions throughout its history as a label. As Rod Stradling, in his launch address for the set, remarked: 'It has been my intention, with these Musical Tradition CDs, to attempt to include all (or as much as was reasonably practicable) of a performer's recorded repertoire, and as full as possible an account of their life. I believe that only this approach affords the performers the proper respect they deserve.' Because of this exemplary approach, of course, not all of the tracks make for easy listening - some of the recordings made by the Makem family, even with careful refurbishing, are still not an audiophile's delight. Yet taken as a whole, the set is a treasure trove, revealing not only the many gems in Sarah's repertoire, but also its variety and breadth, giving us special insight into a specific singing community at a moment in history as exemplified by one highly gifted and remarkably retentive singer. I was pleased to find that the set included Peter Kennedy's recordings of Annie Jane Kelly, whose easy-going, slightly melismatic style - while similar in many respects to her cousin's in its phrasing and ornamentation - also makes an interesting contrast with Sarah's more deliberate delivery. There are also tracks with son Jack on whistle, Tommy Makem on whistle and vocals, as well as a duet with Annie Jane on Derry Gaol. These tracks give us a glimpse into the larger family tradition. 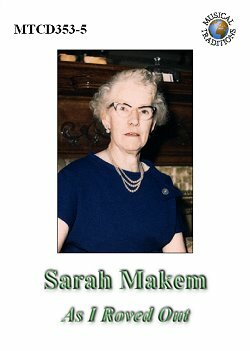 Sarah Makem, 'an ordinary woman with an extraordinary gift', was born in 1900 in Keady, South Armagh. Her mother's family, the Greenes (especially her mother, grandmother, cousin, and her uncle), were known locally as musicians and singers. Singing was an integral part of community life in general, however, and the young women who worked in the linen mills (as did Sarah for some time) helped keep 'their sanity intact' by singing as they walked to and from the mill and as they toiled at their looms. There were also songs at street dances, on special occasions, and during ordinary house visits; not surprisingly, after her marriage to Peter Makem (himself a flute and fiddle player), Sarah's own house became a céilí house. She was also well-known for singing at her household tasks - indeed, at any time at all. She derived her repertoire from a wide variety of sources: family members and neighbours, travellers and merchants from Scotland and England, the radio and gramophone, and from community and family connections in Dover, New Hampshire, where many Keady residents had emigrated in search of work in the New England linen mills. Sarah herself made several visits to Dover, and a number of her songs (including tear-jerkers like Annie Dear, I'm Called Away and Tin Pan Alley songs like There's Nothing too Good for the Irish) are American compositions. Her Winter It Is Over (a splendid variant of Farewell He, often known on these shores as The Lonesome Scenes of Winter) also reflects the influence of specifically American versions of the song. There are old Sarah Makem favourites here, of course, including As I Roved Out, 'Twas in the Month of January, Barbara Allen, Derry Gaol, and (my personal favourite, Farewell and Remember Me). But there are also surprises. Along with the American and American-influenced songs, there are a number of songs local to Keady, like The Armagh Nationalists, The Banks of the Callan, and Keady Convent. Other Northern-Irish compositions include weaver-poet James Orr's The Irishman and a fragment of schoolmaster-poet Hugh MacWilliam's A Man in Love. There are also English songs like The Jolly Thresher and The Laurel Wear (a version of Cupid's Garden), as well as Scottish-inflected compositions like Robert Burns and His Highland Mary. The range of song-types in Sarah's and Annie Jane's repertoire is also remarkable, encompassing, along with the older ballads and love-songs, political, parlour, and music hall songs. The political songs include well-known compositions like Skibereen and Robert Dwyer Joyce's The Wind that Shakes the Barley, as well rarer items like the Alphabet Song, which offers the listener a potted history of Ireland up to the time of Parnell. There are also songs with a touch of the hedge school about them, like Mary of Kilmore, The Peeler and the Goat, and Dobbin's Flowery Vale. The mood of the songs varies from mournful (It Was in the Month of January) or plaintive (Leave Not Your Kathleen) to declamatory (The Armagh Nationalists) and downright jaunty (The Magpie's Nest and Blow Ye Winds Hi-O). Such a repertoire reflects a community and family tradition not only of considerable depth but also enormous breadth. The notes to the set are extensive and well-informed - again, assembled with the assistance of many collaborators, including not only song scholars like John Moulden, Steve Roud, Mike Yates, Steve Gardham, Maurice Leyden, and Martin Ryan, but also family members, notably family friend Seán Mone and Sarah's great-granddaughter Stéphanie Makem. The fascinating biographical section of the booklet was written by Aideen D'Arcy (case worker with the South Armagh Genealogy Project), with additions and corrections from Stéphanie Makem and Seán Mone, who also contributed valuable information, photographs, transcriptions, and memories about Sarah, the 'singing Greenes', and the world in which Sarah lived her life and sang her songs. Those already familiar with the Musical Traditions magazine, website, or recordings know that everything the Stradlings and their associates do is a labour of love, but in this case, the labour must have been Herculean, entailing, as it did, not only the compilation of the recordings themselves (with which the Makem Family and the Irish Traditional Music Archive - who contributed thirty-three additional recordings made by Diane Hamilton in the '50s and early '60s - were particularly helpful), but also the assembly of information for the 48-page booklet. All involved are to be congratulated on this ambitious and highly successful undertaking.